Absolutely magnificent Easter Eggs crafts tutorial for you today. Hello Fine Craft Guild Friends! This is Mette from MonstersCircus. I’m so excited to share this post with you today. 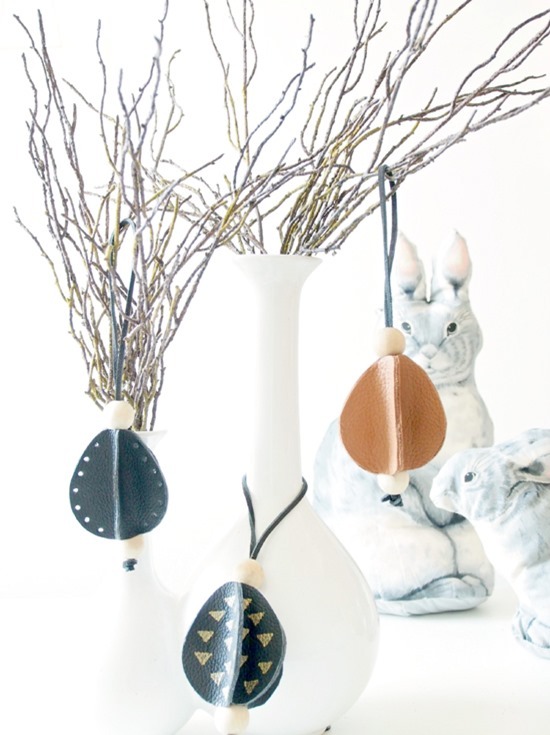 Here in Denmark we celebrate Easter with bunnies and eggs and I like to decorate with long-lasting ornaments year after year. These eggs are easy peasy, no sew and it won’t take long for your to make a bunch. 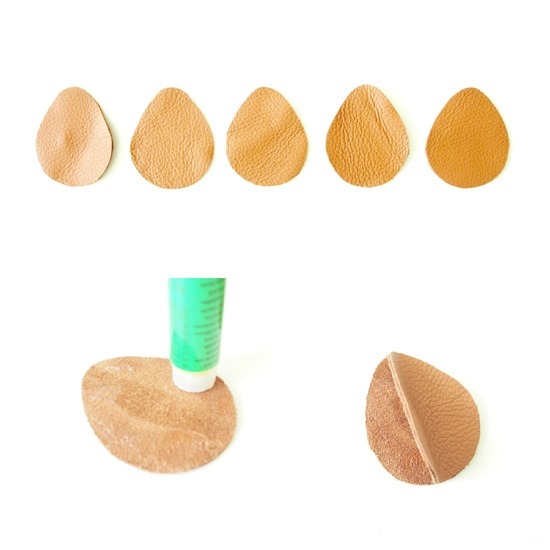 They are made in leather but you can replace it with felt or maybe fabric and there’s so many ways to personalize, let’s jump right into the tutorial. 2 beads, I used natural wood beads. Start by drawing an egg shape on your cardboard and cut your egg silhouette. 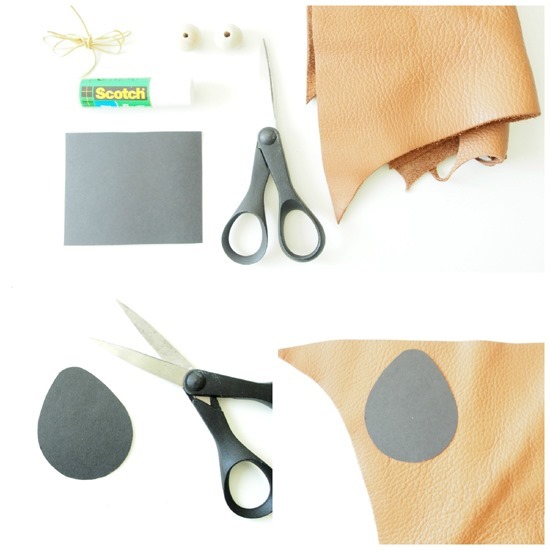 Place your silhouette on your leather scraps. Put glue on the backside of the leather, but only on one side (the middle should be left clean without glue). Repeat with all of the 5 pieces, until you’ve got all the way round. Put a bead on your cord as pictured. Place the cord in the middle of your egg and finish with the last bead and make a knot. You can enjoy the eggs as they are, or… You can style them with your personal touch for e.g. If you have a kelp, pierce the leather along the edges and it will look like this. It would also look pretty nice with a crochet edge in the holes you’ve just pierced. Or do you favor to stamp? I have made a stamp in rubber and with textile paint, you can make the pattern you prefer. I hope you’ve got tempted to decor your home with these eggs, for spring and Easter. Thank you Rose for having me. 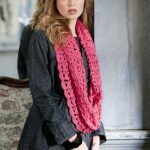 I think all of you out there would agree with me that this blog, Fine Craft Guild, is just like a giant Easter egg filled with great surprises and so wonderful ideas. It’s such a delight to browse through all the amazing ideas! You are SO welcome to visit me. Crafting is all about to sharing and making new friends. I would love an hello from you. 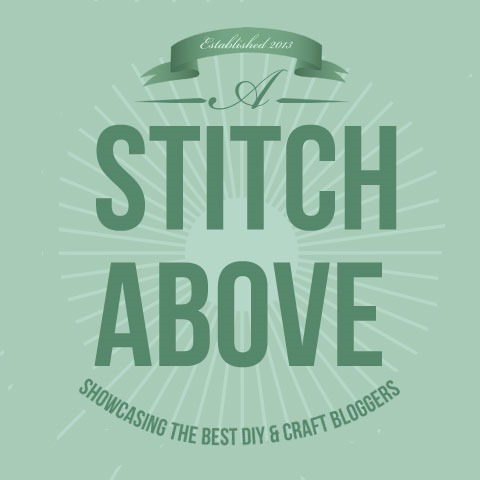 I have picked Mette to be the first in the series ‘a Stitch Above’. Her work amazes me, week after week, as she participates in our linky party. I am so grateful that she joined us so I could find her blog. 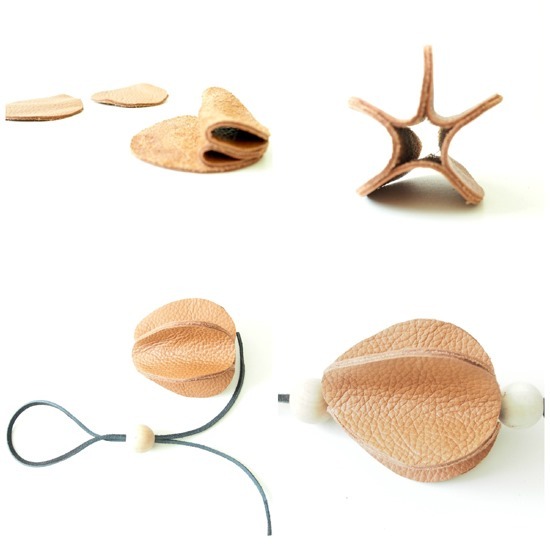 I love everything about Mette’s work. 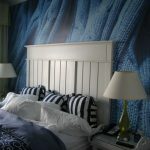 Being a Picasso fan myself, this is the first project of Mette that really caught my eye. 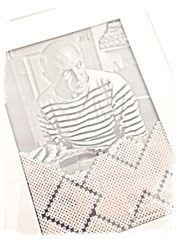 At first glance, it looked to me that Picasso was framed behind blocks of cross stitches. I thought that that made such a cultural statement, besides being aesthetically pleasing. Turns out that the ‘cross stitches’ are really perler beads. Mette is one of those most humble artists whose drive is to be creative, every day. Seems like getting creative inspiration to her is like getting fresh air to normal people. While it is obvious to me that Mette is an artist ‘by birth’, she only started blogging mid 2012. Her Danish blog, Monsterscircus, has English subtitling, and like her project here today, it is minimalist in style & color and contemporary in every which way. Being verbose about Mette seems sac-religious. Her well-illustrated projects need little words. 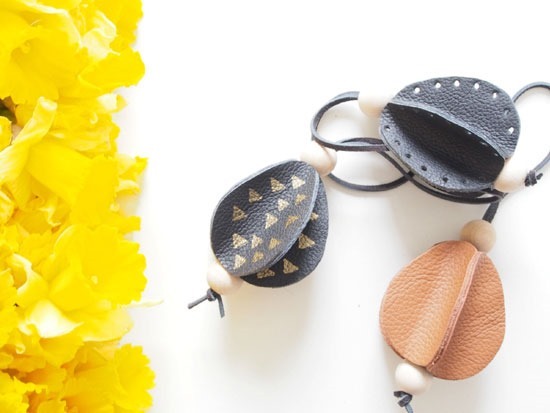 This DIY leather Easter eggs design project lies in the heart of what her blog is about: home decor, fashion jewelry, bags and accessories. Most of her projects are easy. All of them are as great as these wonderful DIY Easter Eggs. 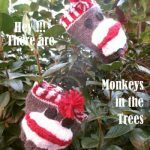 Thank you, Mette, for being you, and for your wonderful guest post here. We really appreciate it! Beautiful! Those eggs are amazing, stylish and pretty and quite cool! Love them. They are so beautiful!! 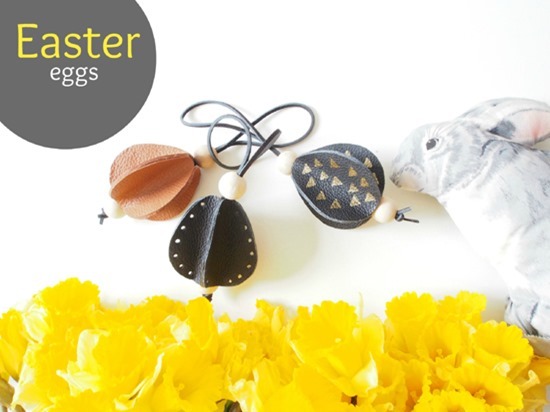 Of Course you would make leather eggs Mette!! 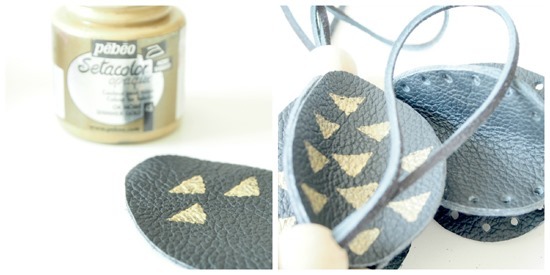 Really Love them – especially the black one and the wooden pearls. Another great project!! Such good idea to make eggs ornaments. Easy to follow and inspiring. Love to read her blogs too.